The gathering of goalkeeping data continues here at Differentgame. 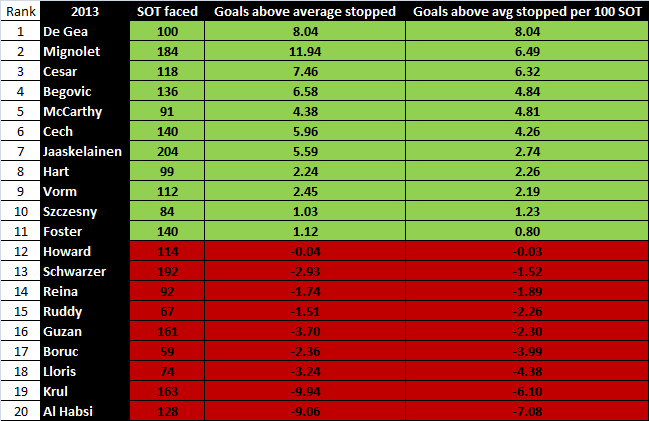 There’s well over two seasons and 7000 saves in the databank, and as we saw with our location work on shots and chance creation, there is little difference from season to season in the numbers so far on shot-stopping. League averages are holding pretty steady. Our goalkeeping model is based purely on shot location. We have split the penalty area and surrounds into 46 different locations. And based on what’s happened before, we’re able to put a value on the likelihood of a shot on target resulting in a goal. By the end of the season there’ll be at least 12000 saves recorded as we continue to trawl back through the seasons and collate this years numbers too. Using this we can compare individual shot stoppers to the average as we did here for the @simongleave piece for Dutch national daily, de Volkskrant. The Dutch is slightly less double there thanks to Google translate. Dutch readers can get the original here. We see the keepers we’d expect to at the top of the list. The one big surprise is Petr Cech down there at the bottom amongst the relegation fodder. More on that later. We see a lot of the same keepers in green – De Gea, Hart, Mignolet, Begovic, Vorm, Foster and Cech there right back in the mix where you’d expect him to be. We also see the reason perhaps why Reina got shipped out of Liverpool during the summer. Cech remains amongst the best so far this season but we see a sharp decline in some of the biggies – Hart, Mignolet, De Gea and Begovic. Part of the reason for this may simply be the small sample size after just 13 games, but we think there could be another reason for some of them. 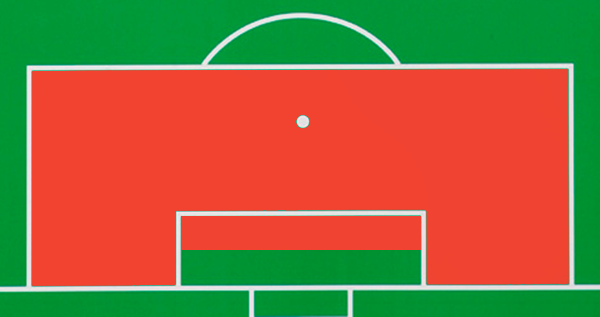 At Differentgame we call the back half of the 6 yard box (in green in the graphic below) a keepers comfort zone. This is where the overwhelming majority of saves are made. David De Gea has made this place his home. As soon as our gloved ones stray into red territory, things start to go awry. Contrast that with this week when he came out all guns blazing to flatten Danny Welbeck and give away a penalty. He’s there to plug the gap made by Tottenham’s high defensive line. When it goes wrong, it goes haywire and as the last line of defence, a keeper needs to be able to concentrate and the timing of when to come is crucial. It’s really quite amusing to see a keeper used to staying on his line behind a tight defence having to suddenly come out to snuff danger. Cech is always with forward momentum here (unlike Lloris) but even so, it’s still incredibly difficult to time coming out correctly and get your angles right to boot. And this is a keeper generally considered to be among the world’s best. Asmir Begovic made 29 of his 136 saves last year outside the Comfort Zone. This season he’s already made 22 out of 62 saves outside it. He suddenly finds himself below average for shot stopping in our rankings. We see him in what might be an unusual situation for Pulis-Stoke as they get turned around by Palace. At the end of the video here you can see Darren Bent turn Begovic inside out as the Bosnian comes out to close him down. There’s more uncomfortable viewing for this looping header from Sagna and these long range strikes by Sturridge and Howson. We saw in the above video that Mignolet can get it right when coming out quickly to narrow the angle. But Rodgers is another manager wanting his team to play a high line. In theory, this means Mignolet will be starting to leave the Comfort Zone more and this is indeed the case. It’s unlikely the Belgian will continue to get it right every time. We can, however, see the problem with more aggressive positioning with the goals conceded this season against Cabaye, Livermore, Ramsey. Reina fared well by our measures until Rodgers came along. Last season he had a nightmare. Having watched all the goals Liverpool conceded several times over, Reina appears caught in the headlights. Often exposed to players bringing the ball into the box unopposed it looks like he doesn’t know when to stick or twist. It degenerates into Howler City as both he and the defence make all kinds of mistakes. Mignolet’s currently high save% doesn’t look quite so good when quality of shot position is taken into account in our model. Liverpool are conceding as many shots on target as relegation threatened sides at present. However, they are restricting teams to poor areas for shooting in the main but as we see, Mignolet isn’t always dealing with them effectively. De Gea continues to stay rooted to his line. However, United are dominating the ball in the opposition half much more under Moyes (yes, believe it) and there’s the odd sign of him being exposed here and here. How the Spaniard deals with set pieces, though, leaves more to be desired but our model only accounts for open play shots at present. So there’s two separate issues here. Firstly, aggressive positioning on shots when often there’s no need. Having watched plenty of footage there doesn’t seem much evidence that it’s keepers narrowing the angle that puts shots off target. It seems like defenders that cause this to happen in most cases. We’ll be studying data to confirm or deny this in future. This entry was posted in Sports and tagged Al-Habsi, Begovic, comfort zone, De Gea, goalkeepers, Hart, Howard, Jaaskelainen, Keeping model, Lloris, Mignolet, repeatability, Szczesny. Bookmark the permalink. Great stuff. Keep up the good work. 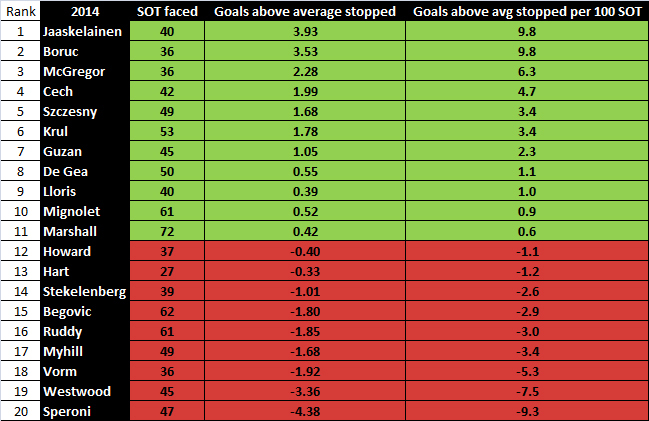 I am curious if there are there particular areas or angles from distance that see goals scored at a higher rate? I have noticed a couple “shot pockets” anecdotely, but don’t have enough stats to back them up. 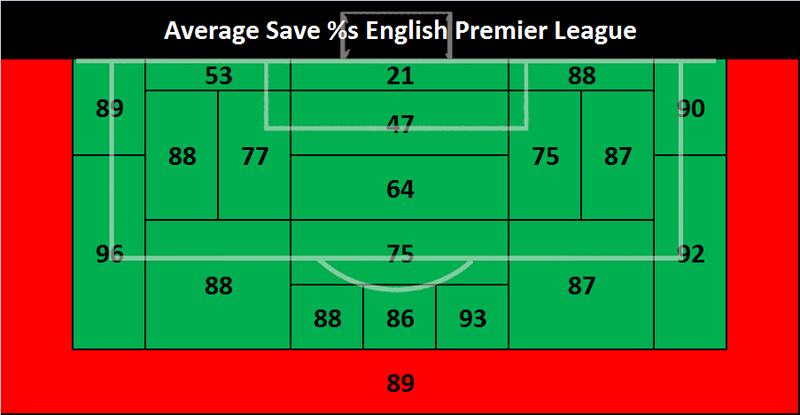 88% of shots saved from the goal-line area to the right of the goals (the keeper’s left) and 53% on the left. Any idea why this should be? Thanks! Sounds like a good theory and a very interesting post. Perhaps, given how this trend changes with keeper positioning, the question becomes about the tradeoffs between giving up more frequent, lower percentage shots with conservative positioning vs giving up less frequent, higher percentage shots with aggressive positioning. I don’t think it is too much of a stretch to say that goalkeeper positioning has an effect on both opponent shot quality and opponent shot frequency. It is possible for a keeper to have universally lower than average shot percentages within each bin but still stop more overall, if he keeps shots in the high scoring percentage bins at a low frequency. I wonder if this tradeoff is seen in any of the data sets? Pingback: StatsBomb | Has Britain Got Talent? Is A Lack Of Data Holding Back British Football Clubs? I’m of the opinion that this is massively overplayed in peoples minds. 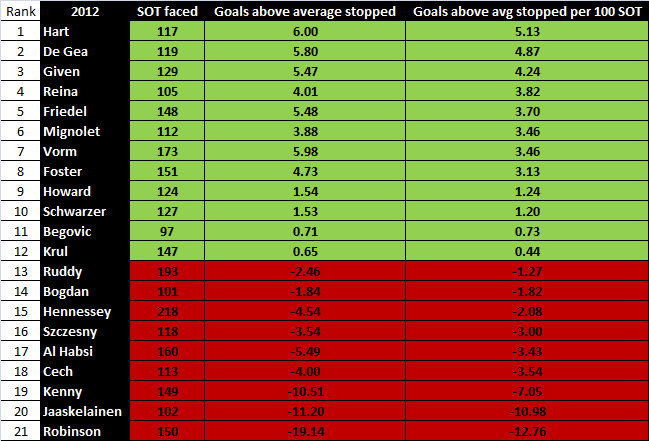 I’ve looked at the numbers and the number of times keepers ‘sweep’, clear up etc is generally negligble. Also that starting further out makes 1v1s more difficult. Unfortunately, lack of footage doesn’t help prove this one way or another. Thanks for reading. More to come on keeps.